After the recruitment on LT & BEd teachers, guest teacher were going to recruit on 6214 posts based on their merit. There were total 6214 posts on which guest teachers was going to recruit, but now Nainital High Court has stopped this recruitment. Mamta Pant and Alok Parmar has put a RTI to ask that if there is lots of seats are vacant then how state govt is going to recruit on 6214 posts. 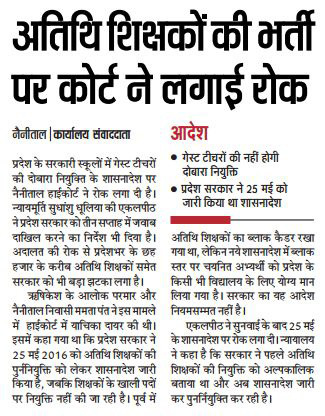 The recruitment process of guest teachers has been banned by Nainital High Court. May be this reappointment of guest teachers will not have done now. Court is asking that before this recruitment govt said that guest teachers will be recruited on temporary basis but after 25 May govt issued order for guest teacher recruitment. High court is asking for an answer on this recruitment. Help us to improve this article/job posting "A shocking news for Guest Teachers in Uttarakhand". We would be glad if you can comment below and provide your valuable suggestions and feedback. If this page have any wrong information/list or out of context content, then you can report us as well. Administration hamare sath khilwad kar rha hai. Iss samay nayi vigypti nikalne ka kya matlab hai. Is gande khel mein n jane ar kitne guest teacher inhe chahiye jinke future ko ye barbad karenge. yeh kisi ke career aur sikshan sanstha ki majbuti aur siksha men sudhar ke liye nahi kar rahi sarkar. har kam ye log vote bank ke liye karte h. public jay yesi tesi men. Sarkar kisi bhi party ki ho sabka yahi hal hai. Samay badd tarike se teachers ko employ kare aur siksha ka star uncha kare to sabka bhala hota.